So many times I have heard the phrases to ‘lose yourself’ and to ‘give yourself away’- does anyone else have serious attachment issues with their ‘self’? I am learning that losing myself means releasing the need to control every little tiny piece of everything. It is that need to control that keeps me from relaxing, keeps me away from my husband, friends and family as I work work work to get everything done and stress stress stress about doing it all. It is far too easy to get my self-worth tangled up in the nuances of the day and the pressures of the future, but I must remind myself more consistently that it is who I am that is so much more. This is great news! 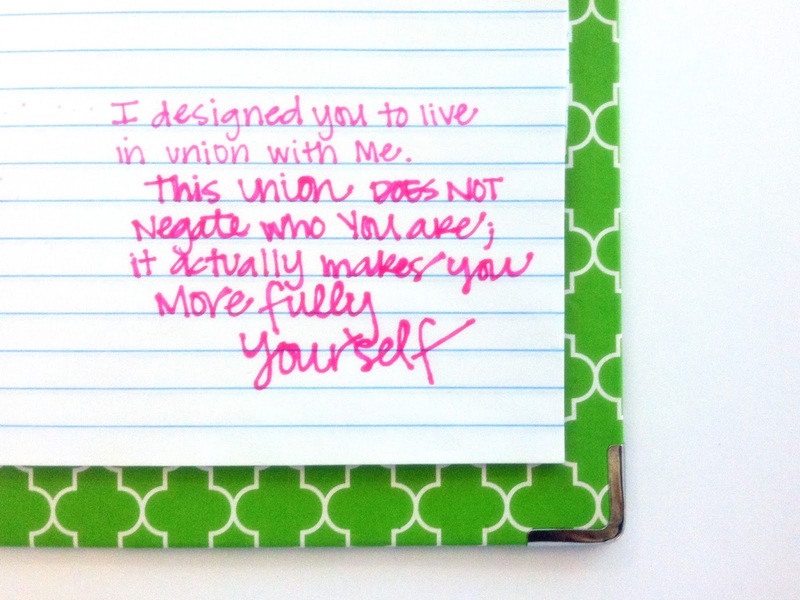 Fully entering into a united life with God doesn’t negate who I am! I can only imagine the endless possibilities that He has in store for my life- for your life. Being able to drop it all and be more in tuned to how He sees me and my life, now that gets my heart excited! I am intrigued and encouraged by these words -what an amazing way to merge the thoughts of His will for my life and my own discovery process! As resistant as I sometimes become, I know that I have begun to experience this true union with God. Every time that I begin my day reading the Bible and that I enter into daily conversation/prayer with Him, I absolutely feel “more fully myself.” And guess what…I love those days so more than the others! He works through every facet of my day to create in me who He believes I should be. A work in progress no doubt, but inching towards conditioning a union with God daily allows me to become more conscience of what thoughts I allow into my heart and more aware of the repercussions they will have. I want more than anything to live this life of being more fully myself and I know that the way there is by allowing God more full control of my life. Practicing and exercising my relationship with Him. It is my hope that next time I begin to hold more tightly to the reins of “my life” that I will be reminded of these words… that giving myself and my life to the Lord isn’t taking away anything, it is in fact allowing me to live a more full life. 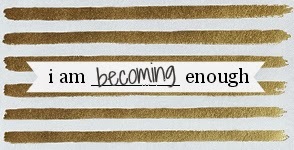 Allowing me to edit my thoughts, to help me really feel my potential and to honestly know that who I am is enough.